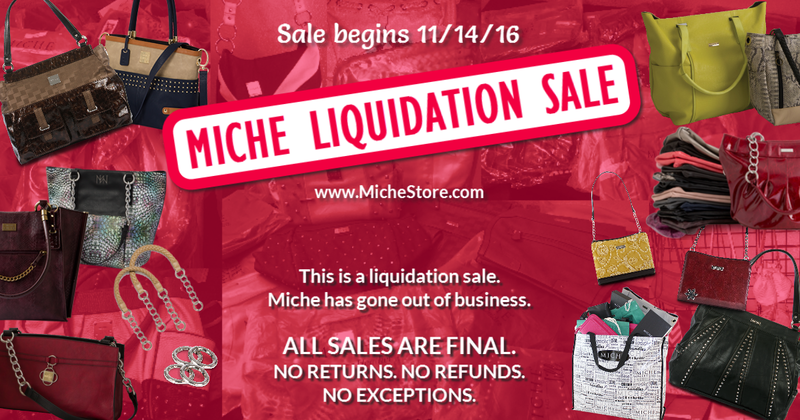 Miche Liquidation Sale | Miche StoreMiche Store | Inventory Liquidation Sale Going on NOW! This is a liquidation sale. Miche has gone out of business. ALL SALES ARE FINAL. NO RETURNS. NO REFUNDS. NO EXCEPTIONS. Everything available for sale will be listed online. All items are available while supplies last and will not be restocked. If an item is marked “Sold Out” or “Out of Stock” it is no longer available. Please do not inquire about items not listed or to check for additional inventory of Sold Out or Out of Stock items. This sale began on Monday, November 14, 2016. At that time not all products had been uploaded. All Base Bags, Shells and Handles were uploaded and published BEFORE the sale began. However, some of the additional accessories and non-interchangeable bags were still being added during the first few days of the sale. Over the course of this sale the final remaining categories (Jewelry, Non-Miche Items, and Miche Promo & Business Items) will be updated. The sale will continue until everything is sold out. If you would like to be notified when these additional items are added, sign up to receive pricing and inventory updates at www.michestore.com/updates. All base bags are brand new in package (NIP) unless noted. All Base Bags are full price. There are not very many in stock and once they are gone, they are gone for good. Base bags are rare and will go quickly. All shells are new in package (NIP) or display models in new or like-new condition, unless noted otherwise. Base bags and any hardware or accessories pictured with the shells are not included unless noted in the description. Some shells (like the Luxe Shells, for example) will include matching handles with the purchase of the shell. This will be noted in the item description. In most cases, the price listed is for the shell only. Unless noted otherwise, all items are in new, unused condition. The store may include a section for miscellaneous Miche-branded and non-Miche items. These items will range from promotional gifts (manicure sets, purse holders, key finders, etc. ), to sales items (display stands, lapboards, table covers, etc. ), and/or other purse themed products. This miscellaneous category is the last of the inventory to be cataloged and may not get added to the online store before launch date. All payments are processed online through PayPal, but you do not need a PayPal account to place an order on this site. You can choose to pay with a Credit or Debit Card at checkout without logging into PayPal if you prefer (see image below). PayPal is simply the payment processor. Flat Rate Shipping: Shipping is available for a flat rate of $15.00 per order for all orders under $200. This is a “per order” flat rate. You pay $15.00 whether you place a $10 order or a $100 order. All orders ship within 3 to 5 business days of payment via USPS Priority Mail to United States addresses only. Orders totaling $200 or more before tax qualify for free shipping. See “Free Shipping” below. Free Shipping: Shipping is waived for any order totaling $200 or more before tax. There is no code needed. When your cart total hits $200 the option to select Free Shipping will become available. You must SELECT THE FREE SHIPPING OPTION from the available shipping choices. The Free Shipping option will only appear as an option if your total before tax is at least $200. There are no shipping charges or fees for Local Pickup orders. See “LOCAL PICKUP” below. There are no shipping charges or fees added if you choose Local Pickup but you must pick up your order within 10 calendar days of purchase date. If you cannot pick up your pre-paid order within 10 calendar days, do not choose the Local Pickup option. Any items not picked up with 10 calendar days will be considered unwanted and resold without refund. Monica’s home office is located in South Sacramento in the Vintage Park area near Calvine Road and Elk Grove Florin Road (95828 zip code). The exact address along with pick up instructions will be sent to you with your receipt (order confirmation email) after completing checkout. Monica’s “Showroom” is no longer open to the public for in-home shopping and all inventory has been packaged for either shipping or local pick up (by appointment). See “LOCAL PICKUP HOURS” below. Pick up times are currently available by appointment only, but are offered 7 days a week between the hours of 9 am and 8 pm for your convenience. A link to schedule your pick up time appointment will be included in your order confirmation email if you have selected the Local Pickup option.